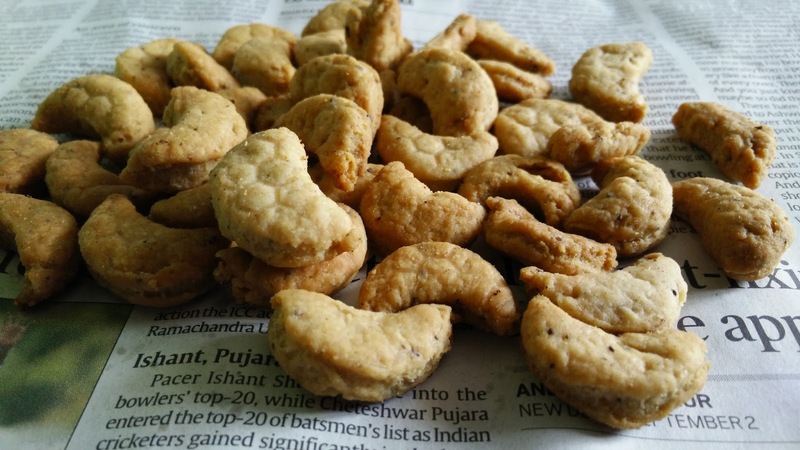 Made the traditional matar in innovative manner by changing the shape from long sticks to a cashewnut shapes and usually the matars or namakpare are deep fried but we tried to air fry these matars. And the result is in front of you..So try out these healthy kaju namkeen matar at home and enjoy as a perfect tea time savory snack. 1. Make a dough of all the ingredients. First mix flour and oil to get bread crumbs like mixture and with a soft hand make a soft smooth dough. The dough should be firm. 2. Divide small portions of the dough and roll it like a roti with a help of rolling pin. Cut out cashew nuts shapes using a bottle cap with sharp edges. Make all matars like this. 3. Preheat the airfryer and put all Chashew nut shaped matar in airfryer at 180 degrees for 10 min. Once airfryed, golden brown colour kaju matar will be ready. Allow the matar to cool down and serve with tea.